Bloom size refers to the diameter of the open bloom. Most daylilies bloom for a single day beginning in the morning and closing in the evening. 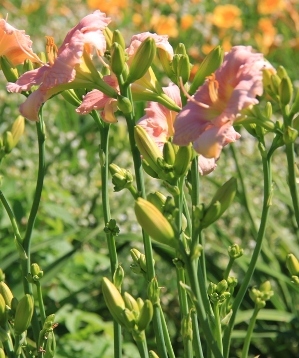 There are three terms to describe the normal and the atypical bloom habit of daylilies. The bloom remains open for at least 16 hours. Branching habit refers to the way buds form on their scapes. Well branched daylilies have a good balance of branches all along the scape rather than clustered at the end of the scape. There are buds in many stages of development on a well branched daylily insuring a very long bloom period. It used to be thought that foliage type determined how hardy a daylily would be. We were advised to grow dormant daylilies to ensure survival in our zone 4 garden. But, now we know that foliage type does not determine hardiness. Some evergreen daylilies are rock solid hardy and some dormants have proven to be poor growers in our zone. All the varieties we offer have performed well for us here in Ottawa (USDA zone 4). We provide protection for all of our plants over the winter by spreading mulch to the depth of three to five inches. While this is not always necessary for their survival, it keeps them from sprouting too early and being damaged by a late frost. The best way to find daylilies that will be hardy in your garden is to buy them from a nursery who is field growing them in your area. You can also obtain information by looking at the recommendations of local daylily societies and popularity polls for your area. When a cultivar is registered, the hybridizer provides a written description to the registrar of the American Hemerocallis Society. These descriptions are used as the basis of the descriptions in most catalogues. Unfortunately no standard colour chart exists. Thus, a daylily described as pink can range from creamy pink, through peachy pink to old rose. Sometimes we wonder whether the hybridizer might even have "rose coloured glasses on" when describing some new introductions. This makes it difficult when looking for a specific colour. Photographs don't always help because colours vary with the type of film, light exposure and filters used. We have used the registration descriptions to form the basis of our catalogue but we have added our own editorial comments. In cases where a registration seems out of line, we have changed the colour description to reflect what we believe to be more accurate. Please call if you wish assistance in making your selections. Appearance of having a layer of glitter on the bloom. This will be most visible on sunny days. A bloom with distinct colour markings just above the throat is referred to as having an eye. A less distinct marking is a halo. There are many different flower forms or shapes. The American Hemerocallis Society recognizes five terms to describe the flower forms of daylilies. Single: The most common flower form of a daylily consists of three petals, three sepals, six stamens and one pistil. Double: Double daylilies come in several forms. There are those that have extra layers of petals so they look like a flower within a flower and those that look like peonies with extra tissue on the stamens inside the petal whorl. Spider: A flower whose length to width measurement is at least 4 to 1 (4:1) The length measurement is taken by extending the segment fully. The width measurement is taken as the segment naturally is. Unusual Form: This group of daylilies have petals or sepals that are pinched, twisted, quilled, cascading or spoon shaped. Polymerous: These are daylilies that have more than the normal number of segments in a bloom. They may have extra sepals or petals. Daylilies are categorized into three divisions: evergreen, semi-evergreen, and dormant. Dormant daylilies die back to the ground each fall. Evergreens hold their foliage until the ground freezes and in warmer climates may remain green all year long. Semi evergreen is the term used to classify any daylily that is not clearly either dormant or evergreen. The height of a daylily is measured from the ground to the top of the scape when the daylily is in bloom. The tendency to have more than one cycle of flowering is known as rebloom. Some daylilies bloom and then have another later season of bloom. Others have a succession of bloom periods over several months. The hybridizer provides information on whether the daylily reblooms in his or her garden. A daylily registered as reblooming may not rebloom for us. So many other variables like culture, rainfall, soil fertility and amount of sunlight affect rebloom. We have found that provision of adequate moisture during the season is the most critical to good rebloom. A scape is a leafless stem which carries the flowers. Most scapes have one of more branches which carry the buds. Terms like early, mid season and late season indicate the approximate time a daylily blooms. Bloom season begins with the first daylily to open and ends with the last daylily to bloom. In our garden that time spans mid June to the end of September. Peak bloom refers to the time when the greatest number of daylilies are in bloom, which for us is from the middle to the end of July. Daylilies registered as mid season will bloom during that time in the Ottawa area. All other bloom times fall on either side of that time frame. Refers to the thickness of the tissue structure which determines the ability of the flower to stand up to the elements. The usual number of chromosomes in a daylily is eleven pairs (Diploid). Tetraploid daylilies carry twice as many chromosomes. The tetraploid factor tends to emphasize many desirable traits, such as larger and thicker petals, brighter colours and very robust foliage. However, there are many outstanding diploids that are just as vigorous and colourful.